The Vancouver International Maritime Centre (VIMC) is on a mission to grow the city and port into one of the world’s premiere maritime centers. Maritime Reporter & Engineering News recently spoke with Kaity Arsoniadis-Stein, Executive Director of the newly re-established VIMC, for her insights on the pace and direction of the initiative. Let’s start out easily. Why Vancouver? Why now? Why Vancouver? Projections and studies indicate that global trade will increase and shift to the Pacific due to the demand of resources by China and India. Canada is a resource rich trading nation that spends billions on infrastructure and corridor initiatives as well as global trade agreements. Why now? Updates made in 2014 to Canada’s Income Tax Act provide additional benefits to international shipping companies based in Canada and companies can perform a wide range of activities in Canada without creating a taxable presence. These advantages are enshrined in federal legislation and have been there since the early 1990s. Also, it should be noted that Port Vancouver is the largest port in Canada and the most diversified in North America with over 3,000 vessel calls in 2015 and 140 million throughput, with a strong cruise industry business, too. So if the Vancouver International Maritime Centre (VIMC) is intent on driving this initiative, provide some insight on where you are today. What we are doing is an ambitious initiative, and when you look at maritime centers around the world, it is a 10 to 20 year process to get them established. We are in year two. I believed in it before I started, and two years in I believe in it even more: the potential for Vancouver is enormous. To date I’ve met with (C-Suite executives at) more than 400 ship owners, and generally what the sentiment has been, ‘you know, we didn’t even think of Canada.’ For me what is important is to raise that awareness. At the same time I’m sensitive to the other established maritime centers; we are not trying to disrupt the other maritime centers that are out there. What we want to do is offer yet another option for North America. If it makes business sense, Canada is a major player and they need to know that. But you already have a good start, in terms of companies present, correct? There are a number of international shipping companies and shipping lines in Vancouver including Teekay, Seaspan, Valles, Oak, Fairmont, Waterfront, Inter-Oceans, CSL, Gearbulk, GriegStar, Hanjin, China Ocean Shipping, CMA CGM, Evergreen, Seabridge, Oldendorff, MSC, etc. All of the Classification societies have a Vancouver presence and DNV GL is the largest. Furthermore, there are many agents including ACGI Shipping, Canpotex, Colley West, Compass Marine, Montship, Westward Shipping, Wilhelmesen, the list is extensive. Teekay Corporation, now one of the world’s largest marine energy transportation, storage and production companies moved into Canada in the early 1990’s and from its Vancouver base created five publicly traded companies and has expanded into other segments such as gas and offshore. Seaspan Ship Management, the largest independent container leasing company in the world can boast the largest IPO in the marine sector on the New York Stock Exchange, when it went public in 2005. Methanex, the world’s largest producer and supplier of methanol to international markets is headquartered in Vancouver including its shipping arm (a wholly owned subsidiary), Waterfront Shipping. Six of their product tankers are duel fuel, capable of running on methanol. And there is more. Vancouver can boast its very own Arbitration Association, the Vancouver Maritime Arbitrators Association, with more than 50 arbitrators on the roster. And Vancouver is also home to several world leading engineering and technical companies, including Robert Allen Naval Architects and VARD Marine. Discuss a few recent successes since VIMC’s re-establishment? AAL shipping is a multi-purpose operator, opened a branch in Vancouver for business development opportunities and to bring the AAL brand closer to local shippers. Greystoke Marine Management, a company founded by ex-Teekay senior executives, established its start-up company in Vancouver, to provide commercial and technical expertise to financial investors in the shipping industries. Norton Rose Fulbright, one of the world’s largest maritime law firms established a significant presence in Vancouver in January 2017.Harry Theochari, senior partner with Norton Rose Fulbright in London attributes the decision to position into Vancouver to be based on the forecast of the high demands from Asia including South East Asia for Canada’s resources where a young population will have high demands for resources and that Vancouver’s maritime industry will be pivotal in helping Canadian businesses continue to meet this demand. You are the ‘tip of the VIMC spear.’ Who fills out the VIMC team? We have a dynamic and enthusiastic team that drives this initiative forward. I give exceptional mention to Yvonne Rankin Constantine, our Director of International Business Development and Marilena Kostakos our Director of Projects. Furthermore, we have a representative running our Greek Office, George Giannakis. We also work with incredible consultants including David Van Hemmen and Global Public Affairs. VIMC is fully funded by government, with government funding our promotional activity for three years to get this off the ground. We’re working now toward a five year extension of funding to give the initiative more time to gain support. When and why did you personally get involved in the VIMC? My previous position was as the President and Secretary-General of the International Ship-owners Alliance of Canada. In my role representing ship owners to government and internationally, I recognized the incredible advantages Canada offered. So I recommended – to the owners and to the government – that Canada’s advantages should be communicated globally. What is the core value proposition to get maritime companies to move to Vancouver? Canada has a strong banking system, political stability, universal healthcare system, world-class universities, a highly skilled educated work force with a strong social infrastructure providing a high quality of life. Canada is a western, strong, modern economy and provides a stable environment for companies wishing to be associated with the Canada brand. How has VIMC/Canada has invested to attract maritime companies to the region? We have a simple strategy that focuses on raising awareness of Canada’s advantages, and showcasing the strong Canada brand. VIMC provides advice, information and assistance to international shipping companies interested in establishing a presence on Canada’s west coast. The maritime industry is obviously in a down cycle across several sectors. How has this impacted the trajectory and pace of your mission? Certainly the down cycle has had an impact, but following Brexit and the U.S. elections, VIMC has received an increase in interest from various companies. In comparing Vancouver to other established maritime hubs, realistically how does Vancouver stack up? Where are you strongest? Canada’s system is very simple. There is no tonnage tax, no obligation to flag a percentage of your fleet into Canada, no minimum commitments, such as time or number of employees and the provisions allowing exclusion from tax in Canada on the foreign earned profits from international shipping companies are enshrined in federal tax legislation. Furthermore, the administration costs of running an entire corporate group is significantly reduced because of our simple rules. Ultimately, how and when will you measure whether this push has been a success or a failure? As you well know, establishing a global shipping hub probably takes a decade or two, and we are now only in our second year. From where I sit, I can talk about the incredible interest Vancouver has received from ship owners from around the globe both in Europe and Asia. At the moment we are working with 10 companies that are establishing their branch offices in Vancouver, we are working with another 50 companies to provide them with information on tax, structures, immigration, banking, etc. This has, to date, been very successful. 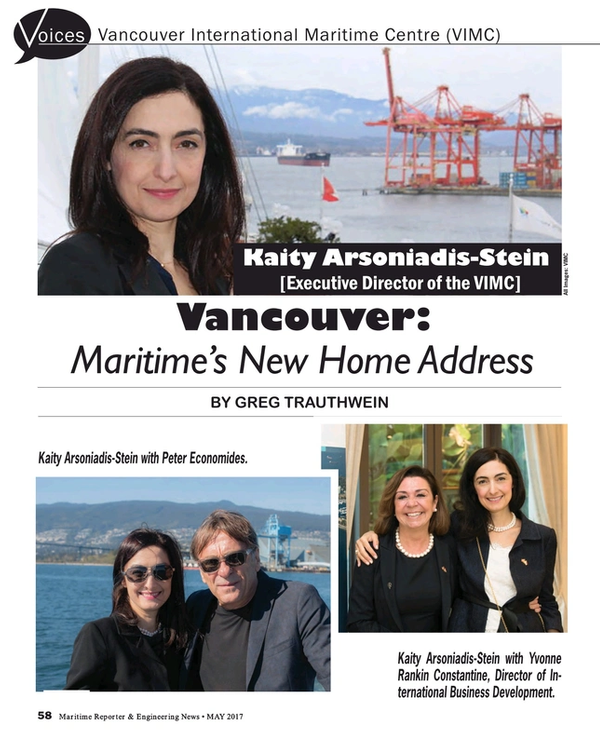 Kaity Arsoniadis-Stein is the Executive Director of the newly re-established Vancouver International Maritime Centre. A maritime lawyer by profession with a Masters in Maritime Law with merit from Kings College London, Kaity has over 15 years of experience in the global shipping industry having started her career with the Vancouver law firm Bull Houser & Tupper. Kaity has worked for various international firms such as Gard (UK) Ltd., the National Oil Refineries of Greece and international shipping companies such as Teekay Shipping Ltd. and Seaspan Ship Management in Vancouver, Canada. Kaity’s previous position was with the International Ship Owners Alliance of Canada (ISAC) as the President and Secretary-General. During her tenure there, she worked in close collaboration with ship-owners and all levels of government promoting the interests of ship-owners based in Canada. She is called upon by government as an industry advisor to Transport Canada and Environment Canada, as well as the House of Commons and the Senate of Canada. She was also appointed by the Premier of B.C. as the transportation lead for the British Columbia Jobs and Investment Board. Kaity’s global expertise in shipping has enabled her to participate in policymaking and business development through various high-level consultations within government forums and roundtables. A prominent member of the shipping community, Kaity is a member of the Canadian Maritime Law Association and has been past President of the Vancouver Maritime Arbitrators Association, Trustee of the Insurance Dispute Resolution Services of BC and Trustee of the Vancouver Maritime Museum. In 2005, Kaity was appointed by the Government of Canada as a member of the Pacific Pilotage Authority. Kaity has been awarded Honorary Membership of the Company of Master Mariners of Canada and in 2012 she was awarded the Queen Elizabeth II Diamond Jubilee medal by the Governor General of Canada.